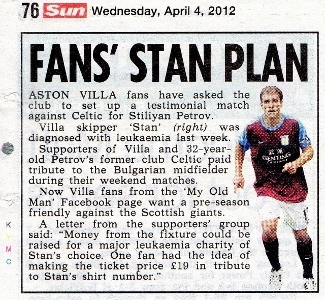 It’s not the Aston Villa versus Celtic game that supporters of both of clubs wanted to see to celebrate the career of Stiliyan Petrov, but the charity match, as well as having a Celtic XI and Stiliyan XI managed by Martin O’Neill and Kenny Dalglish, will feature some top-bill names. Henrik Larsson, Brian McClair and Neil Lennon will turn out for Celtic, while Stiliyan’s team will feature the man himself and a whole host of top names, including Villa manager Paul Lambert, John Terry and Roy Keane. The Stiliyan XI will also boast quite a few ex-Villa favourites, including Bouma, Barry, Friedel and Cuellar. The funds raised will help others across the country facing a similar diagnosis to Stiliyan. In addition, Celtic Charity* will make a donation to Glasgow NE Foodbank, which will open in September in response to growing levels of food poverty impacting men, women and children across the North and East of the city.